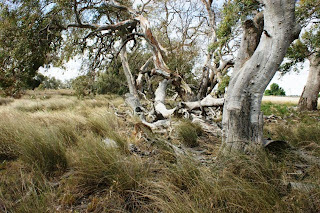 Tang Tang Swamp – one of the sites to be visited on the Loddon Plains Landcare Network Tour , more details of the trip and other sites will be posted soon. p (NRE, 1995) including The Darter Anhinga melanogaster (Src), Great Cormorant Phalacrocorax carbo, Little Pied Cormorant P. melanoleucos, Little Black Cormorant P. sulcirostris, Pacific Heron Ardea pacifica, Rufous Night Heron Nycticorax caledonicus (Src), Royal Spoonbill Platalea regia (Src), Yellow-billed Spoonbill P. flavipes, Black Swan Cygnus atratus, Australian Shelduck Tadorna tadornoides, Australasian Shoveler Anas rhynchotis, Purple Swamphen Porphyrio porphyrio, Eurasian Coot Fulica atra, Freckled Duck (Stictonetta naevosa) and Plumed Whistling Duck (Dendrocygna eytoni) (NRE 1995a). Notable flora includes Rush Sedge Carex tereticaulis, considered to be of very limited distribution in the Murray Valley (Beauglehole 1979). The Swamp also holds important social and cultural values. Fourteen reported middens indicate a long history of Aboriginal use of the area (VAS 1992). Ruins of early pioneer huts also remain (A. Chappell pers. comm). The Swamp is used regularly for recreation, including bird watching. The Serpentine Creek is a regulated natural carrier on the Pyramid Channel 12 system. 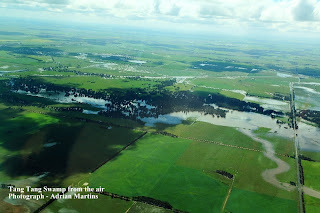 Under natural conditions the creek takes flood flows from the Loddon River near Serpentine and splits the flow between the Pennyroyal and Nine Mile Creeks north of Durham Ox. Currently two outfall structures control flow to the Pennyroyal and Nine Mile Creeks. The Pennyroyal Outfall is part of the Strategic Measurement Program and is SCADA controlled. All outfall water is passed to the Pennyroyal Creek. No outfalls flow to the Nine Mile Creek. Flows from the Loddon River via Bears Lagoon (another site on the tour), becomes Pennyroyal Creek and ends in Tragowel Swamp. Serpentine Creek is a wide (30-40 m) sluggish creek with turbid water. 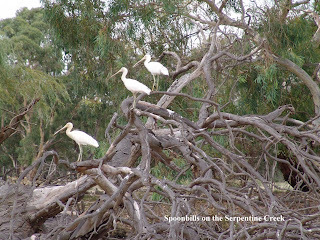 It has low banks with riparian vegetation of reeds, cumbungi and river red gums at Durham Ox. Good water depths (100 cm), some instream snags and aquatic vegetation. Good instream habitat. Main angling species are abundant – golden perch, redfin and European carp. Also goldfish, eastern gambusia, Australian smelt and flathead gudgeon. No recent records of Murray cod. Stocked with golden perch around Durham Ox.